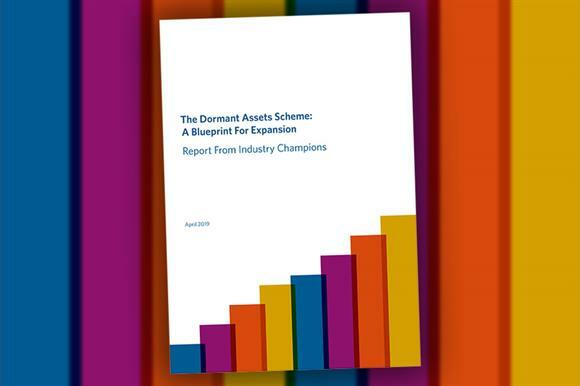 A report from four "industry champions" has set out a blueprint for expanding the dormant assets scheme to include financial instruments such as shares and bonds. A government-commissioned taskforce has previously estimated the scheme could raise £2bn for good causes. The report, which is backed by the government and was published today, sets out a two-phase approach to encourage banking, pension and investment firms to join the scheme and release money trapped in dormant assets. The report defines a dormant asset as one that a firm was unable to reunite with its rightful owner after 15 years. Since the Reclaim Fund was set up in 2011, £1.2bn in dormant bank and building society accounts has been transferred to good causes, the government said. The Independent Dormant Assets Commission was established in 2016. In a report published in 2017 it called for a number of other parts of the financial sector to be included in the scheme alongside banking. The 2017 report estimated that £2bn in dormant assets could be made available for good causes. Four business leaders were appointed last year as "industry champions" to work with the banking, securities, insurance, pensions, and investment and wealth management industries to recommend how an expanded scheme could work in practice. The latest report, which is described as a "blueprint" for an expanded dormant assets scheme, says that any expansion will depend on government passing legislation. Once that is in place, it says, a phased approach can focus on encouraging participants into the scheme, and the inclusion of more complex assets can be considered later. The industry champions said in a statement: "We were pleased to be asked by ministers in June 2018 to spearhead an industry-led approach to expanding the dormant assets scheme to include a far wider range of assets. "Today’s report shows how industry can significantly expand the money available to good causes, while ensuring customers can get their money back." Mims Davies, the Minister for Civil Society, said: "The dormant assets scheme has already benefited millions of people across the country by releasing money to good causes. "I thank the industry champions for their ongoing dedicated commitment and hard work, and for producing this comprehensive report. Ministers will rightly consider the recommendations in more detail, looking ahead to the best possible future expansion of the scheme."